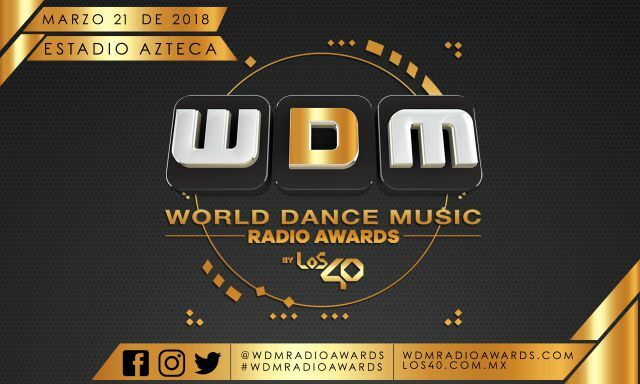 On Wednesday, March 21st, this year’s World Dance Music Radio Awards presented by Los 40- the world’s largest music radio broadcasting platform – will take place in Mexico City at the marvelous Azteca stadium. For its second time around, countries throughout the globe will be celebrating this past year’s highlights on everything electronic dance music related. Known as the most prevalent dance music award show in the world, expectations for this year’s turnout are at an all time high. Los 40 just recently announced the phase 1 lineup for the radio award show as well as its official nominees and corresponding categories. The highly-anticipated show will occur in the eyes of 90,000 electronic music fanatics within its live audience and be broadcast via TV and other online streaming services to millions across the rest of the world. Last year’s WDM Radio Awards successful debut demonstrated that top-of-the-notch live music performances are a must at any purely music driven award show. and this year’s confirmed acts are ones you won’t want to miss. The phase one lineup for the 2018 edition consists of world-recognized EDM producers Don Diablo, Steve Aoki, Robin Schulz, Jax Jones, and Tujamo, with phase two headliners to be revealed in the upcoming weeks. With that being said, apart from the thrilling and energy-pumping live performances taking place throughout the show, a total of 78 acts will be competing across 12 different award categories. Ranging from Best Global Track, Best Remix, Best Bass Track, Best Dance floor Track, Best Trending Track, Best New Talent, Best Electro House DJ, Best DJ, Best Party DJ, King of Social Media, Best Deep House DJ and Best Electronic Vocalist, electronic music enthusiasts from around the globe will be able to vote for their well-deserved favorites until March 14th until voting closes through at www.wdmradioawards.com. Hosting the eventful night is the mastermind behind Los 40 and the WDM concept himself Luis Lopez, with followers throughout the entire world, particularly within the Spanish-speaking markets. With his radio shows consisting of over 6 million listeners each week, he has become one of the most influential electronic dance music radio and media enthusiasts. His WDM global radio music show has given electronic artists the opportunity to break within countries and markets unfamiliar with the dance music scene. Since its upbringing about 8 years ago, The WDM brand has expanded widely, and has even taken part in prominent dance music events and acts such as ADE in Amsterdam, Unite: The Mirror to Tomorrowland in Mexico and Colombia, and several Ibiza show hostings featuring artists like Avicii, Nicky Romero, David Guetta, Steve Angello, Armin Van Buuren, Hardwell, Nervo, and many others. Hence, why Lopez’s idea of creating the first radio global awards for electronic music has been such a huge hit worldwide. Currently based in NYC, I hope to inspire others positively through my writing. Electronic music has become both a passion and a form of inspiration in my life, and I wouldn't change it for the world. I aspire to share this passion of mine with others and help them understand the uplifting potential it can have on our lives!